Canned Heat, Big Brother and the Holding Company (featuring Janis Joplin), Country Joe and the Fish, Al Kooper, The Butterfield Blues Band, Quicksilver Messenger Service, The Steve Miller Band, Electric Flag, Moby Grape, Hugh Masekela, The Byrds, Laura Nyro, Jefferson Airplane, Booker T and the MG's, The Bar-Kays and Otis Redding perform at The Monterey Pop Festival today. While there, Micky Dolenz of The Monkees will view a demo of a brand new instrument called the Moog synthesizer and will be so impressed with it that he orders what will become the second model ever sold. 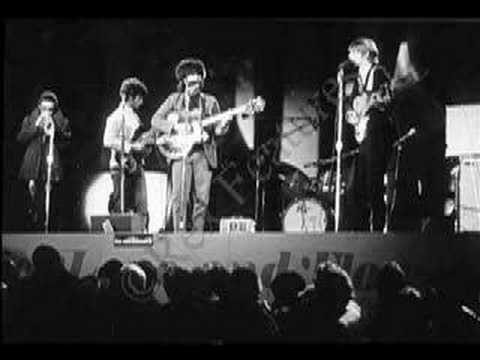 Johnny Rivers makes an appearance on "American Bandstand" while Freddie and the Dreamers appear on "Piccadilly Palace". "Mercy, Mercy, Mercy," the Buckinghams' fourth hit single, made its debut on the Billboard Hot 100 on June 17, 1967. James William Guercio was credited as arranger and producer. The music was composed by Josef Zawinul, an Austrian classical-jazz fusion keyboard and synthesizer player who performed with Maynard Ferguson's band and with singer Dinah Washington before joining Cannonball Adderley's jazz quintet. Adderley's combo first recorded and released an instrumental version of "Mercy, Mercy, Mercy," which had hit the Billboard chart in February of 1967. Buckinghams guitarist and singer Carl Giammarese regards "Mercy" as his favorite Buckinghams song because it brought the band back to its roots. 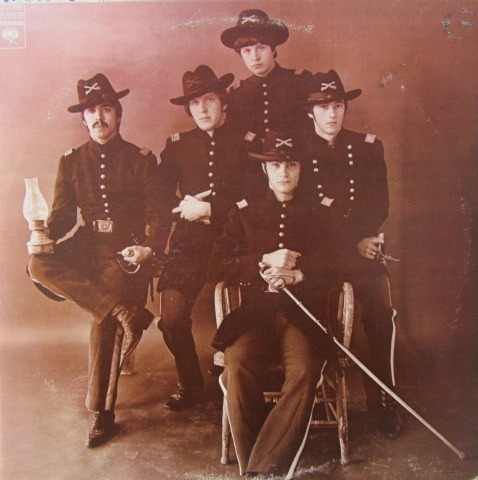 The Buckinghams recorded it for the "Time and Charges" album on which the band's hit "Don't You Care" was the lead-off track. "We were really into that R&B bag. Guercio brought us the soul version of 'Mercy, Mercy, Mercy' that Johnny 'Guitar' Watson and Larry Williams recorded. They had a minor R&B hit with it. Guercio used to play bass with them years before. In those days it wasn't as common to get more than one hit off an album. So that was kind of a surprise hit for us," Carl told authors Marti Smiley Childs and Jeff March for their book "Where Have All the Pop Stars Gone? 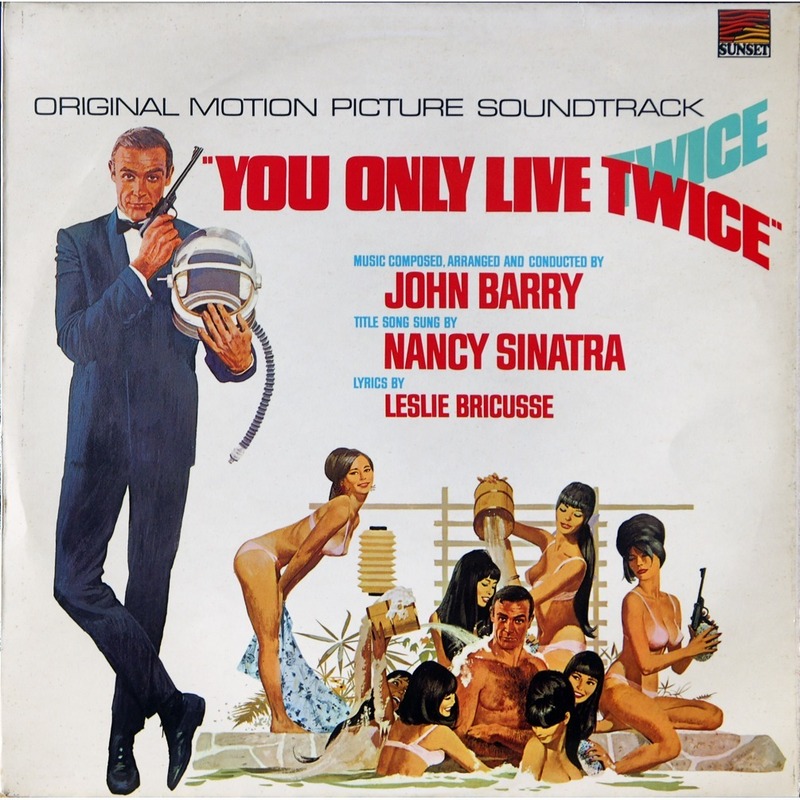 Volume 2"
The Buckinghams' version of "Mercy, Mercy, Mercy," on the Columbia Records label, peaked at No. 5, and remained on the chart for 12 weeks. The Kingston Trio (featuring the long-standing line-up of Bob Shane, Nick Reynolds and John Stewart) perform their final concert together at The Hungry I. (Original founding member Dave Guard left the fold in 1961 to pursue other musical interests.) It was a carefully planned and executed exit strategy … The Kingston Trio would play The Hungry I for two weeks, culminating with their final show there on the 17th. The following day they would announce that there would be no more appearances. The group would reform in various configurations over the years, but this was the last public appearance of Shane, Reynolds and Stewart during their prime. (Actually, the final decline of their prime … The British Invasion and heavier sounds pretty much derailed their chart activity in 1964, just as it did to many of our established American recording stars and institutions.) Ironically Stewart would be able to claim a #1 Record under his song-writing belt by year's end when The Monkees recorded his tune "Daydream Believer." The group was enormously popular during the whole folk craze here in The States, scoring five #1 albums plus 13 more that made The Top 20 between 1958 and 1964, garnering sales of over 50 million copies. 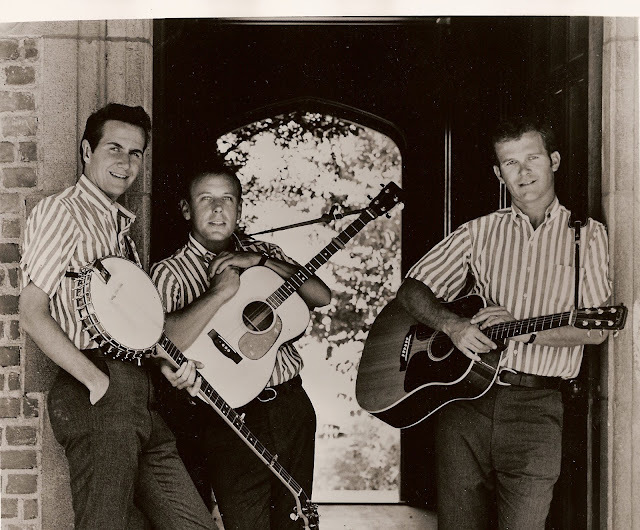 Formed in 1957 out of college, many credit The Kingston Trio with creating "The Folk Revival" in popular music. In the wake of their success, countless new bands sprung up, helping to carry the torch. They made their name at The Purple Onion in San Francisco, where they took up residency for months. Dave Guard died in 1991, Nick Reynolds died in 2008 as did John Stewart. Bob Shane continued to perform until 2004 when a heart attack sidelined him from the road … but today the music of The Kingston Trio is still preserved in concert with a lineup featuring Bill Zorn, George Grove and Rick Dougherty. In 2008, just months before the passing of Reynolds and Stewart, the "power trio" of Bob Shane, Nick Reynolds and John Stewart got together for this performance. Demonstrating to fans that their mood was anything but somber, the Kingston Trio (Bob Shane, Nick Reynolds and John Stewart) bounded onto the stage for their final appearance together accompanied by their longtime bass player Dean Reilly, who was attired in a chicken suit. 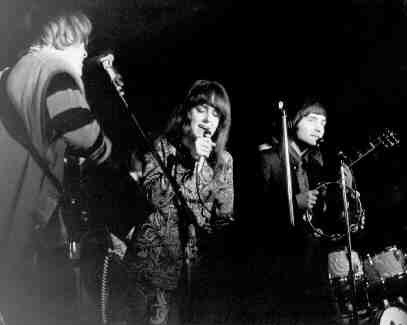 The performance took place June 17, 1967, at the hungry i nightclub in San Francisco, where the group had first come to fame a decade earlier. The appearance culminated an extended farewell tour that spanned most of a year. "We were running out of steam and I knew if I was going to go out and be a singer-songwriter, I had to leave before I turned 30. So we decided to play every farewell gig we could during that year," John Stewart told authors Marti Smiley Childs and Jeff March for their book "Where Have All the Pop Stars Gone? Volume 1." 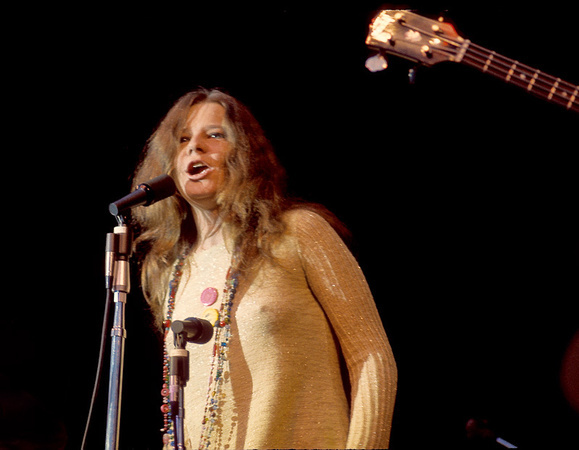 The Trio's finale concert coincided with the cultural shift initiated by the Monterey International Pop Festival, which was under way 110 miles south. Ironically, many of the festival performers who were agents of that change had been influenced and inspired, either consciously or unknowingly, by the Kingston Trio. The top debut on the chart this week is all the way down at #76 as "More Love" by Smokey Robinson and the Miracles makes its first dent on the chart. "Mercy Mercy Mercy" by The Buckinghams is new at #84 as is a Percy Sledge version of the Elvis Presley hit "Love Me Tender" (#93). 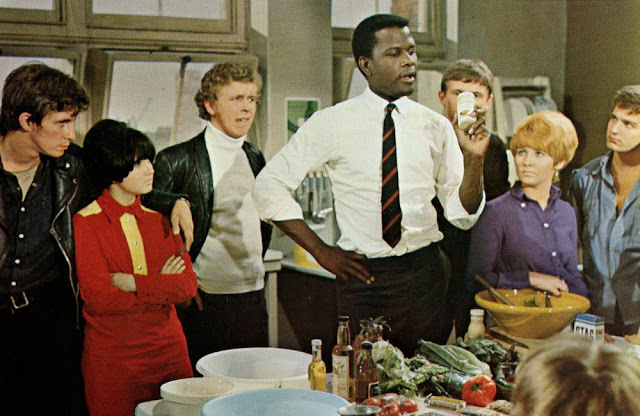 And, although it has yet to earn a bullet, "Carrie Anne" by The Hollies (new at #97) will turn out to be quite a big hit this year. The Monterey Pop Festival (the brain child of Producer Lou Adler, Beatles Publicist Derek Taylor and John Phillips of The Mamas and the Papas) kicks off its three day run in California. It was the first Pop / Rock Festival of its kind and set the stage for other successful festivals and fund-raisers in the years to come. 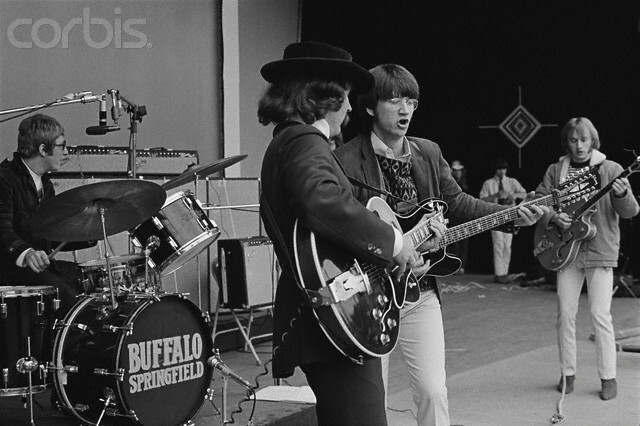 In fact, Tork later acted as MC and introduced his buddy Stephen Stills' band The Buffalo Springfield, for their performance. Otis Redding became an overnight sensation when he captivated his audience with an electrifying performance. The single "Alternate Title" / "Forget That Girl" by The Monkees is released in The U.K. "Alternate Title" is actually "Randy Scouse Git" from their "Headquarters" album and the song will go all the way to #2 on The British Charts. (Micky heard the title uttered on the British television program "Till Death Do Us Part" and found it funny … loosely translated it means "horny Liverpudlian jerk") British Censors found that to be unacceptable so the record was pressed with "Alternate Title" on the label instead! The film "Hell On Wheels", starring country singer Marty Robbins, opens in theaters today. Micky Dolenz and Peter Tork record their vocals for "Words", soon to be the flip-side of The Monkees' new single. 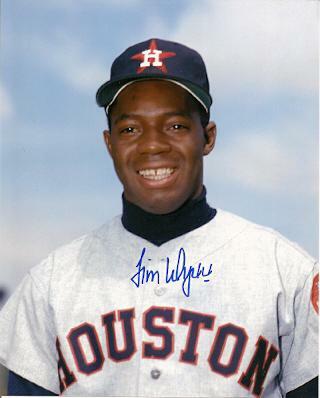 Jimmy Wynn becomes the first Houston Astro to hit three home runs in a single game. It happens at home in The Astrodome. All three are solo shots but it's enough to give the Astros a 6-2 victory over The San Francisco Giants. 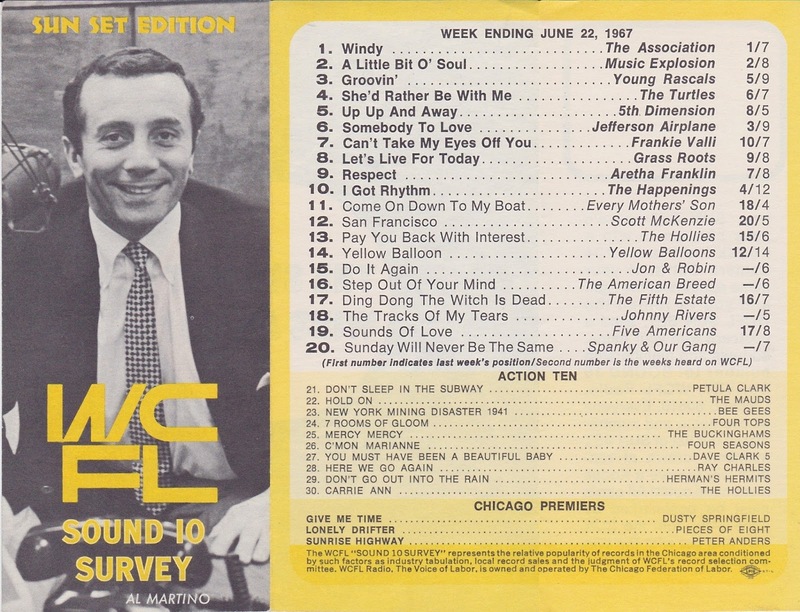 You'll see The Mauds score their first local hit on the WLS Super Summer Survey as their remake of the Sam and Dave soul classic "Hold On" debuts at #30. Outside The Top 40 three records make a jump of 20 places or more … "Light My Fire" by The Doors climbs from #73 to #51, "Shake Rattle And Roll" by Arthur Conley moves from #79 to #57 and "I Take It Back" by Sandy Posey jumps from #84 to #60. Other big movers include "Pay You Back With Interest" by The Hollies (#61 to #47), "I Was Made To Love Her" by Stevie Wonder (#66 to #48), "Soul Finger" by The Bar-Kays (#63 to #50), "You Must Have Been A Beautiful Baby" by The Dave Clark Five (#71 to #53), "Step Out Of Your Mind" by The American Breed (#85 to #73), "Baby Please Come Back Home" by J.J. Barnes (#94 to #78) and "Stay Together Young Lovers" by Brenda and the Tabulations (#99 to #81). In preparation for the worldwide live broadcast of "Our World", The Beatles begin recording "All You Need Is Love", completing 33 takes this evening. Meanwhile, here in The States, The Monkees begin recording "Daydream Believer" … it will later become their second #1 Record this year to feature the word "Believer" in the title. The Doors performed at The Scene, a popular New York City nightclub. In the audience that night was Jimi Hendrix. The Bee Gees appear on the British TV Series "As You Like It", performing their new hit single "New York Mining Disaster, 1941". 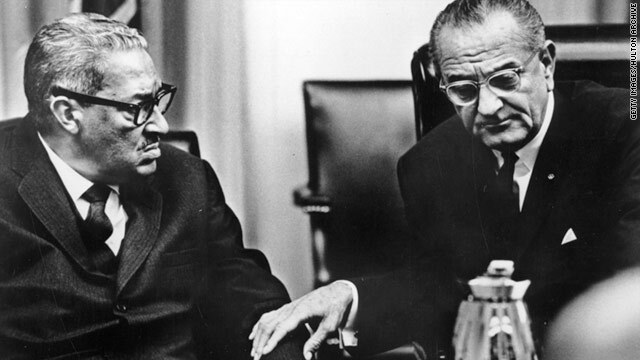 President Johnson nominates Thurgood Marshall to be the first Black Justice on The Supreme Court. Aretha Franklin holds on to the #1 spot for the third week in a row as "Respect" remains the #1 Record in the country for this week in 1967. "Groovin'" by The Young Rascals, the record that held that position three weeks ago, moves UP the chart this week, climbing from #3 to #2 while "I Got Rhythm" by The Happenings falls three places from #2 to #5. 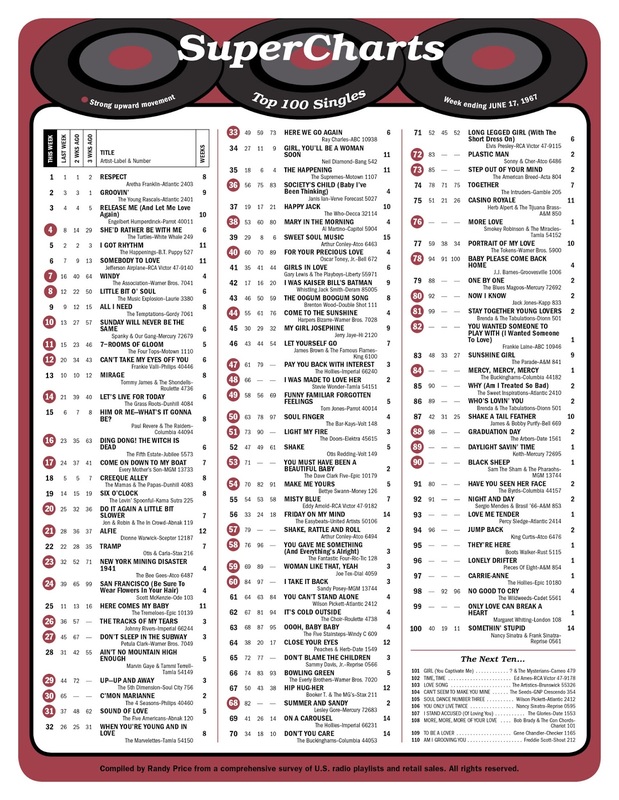 The Turtles continue their ascent up the chart as "She'd Rather Be With Me" climbs from #8 to #4 this week. 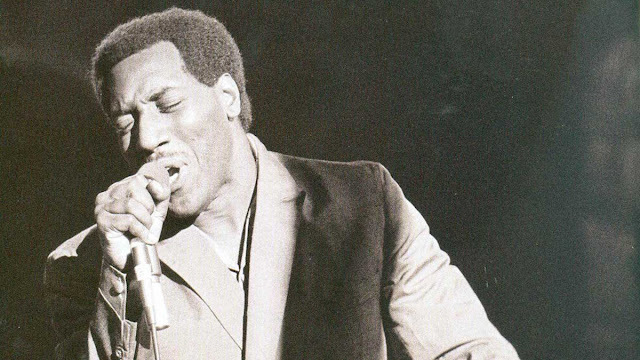 "Windy" by The Association breaks into The Top Ten in a big way, jumping from #16 to #7. (It's already been #1 here in Chicago for weeks now!) Also new in the Top Ten this week are "Little Bit O'Soul" by The Music Explosion (#8) and "Sunday Will Never Be The Same" by Spanky and Our Gang (#10). "Can't Take My Eyes Off You" by Frankie Valli climbs from #20 to #12 and "Let's Live For Today" by The Grass Roots moves from #21 to #14. "Ding Dong, The Witch Is Dead" by The Fifth Estate is also up 7 places (from #23 to #16), as is "Come On Down To My Boat" by Every Mother's Son (#24 to #17) and "Alfie" by Dionne Warwick (#28 to #21). 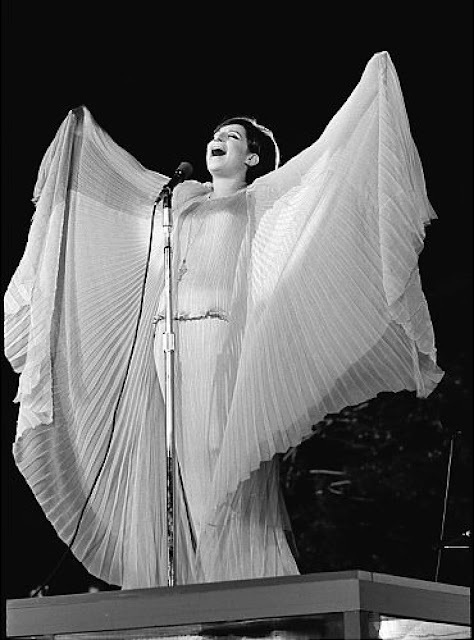 "Do It Again A Little Bit Slower by Jon and Robin moves from #25 to #20, "New York Mining Disaster, 1941" by The Bee Gees (#32 to #23), "San Francisco" by Scott McKenzie (#39 to #24), "The Tracks Of My Tears" by Johnny Rivers (#36 to #26), "Don't Sleep In The Subway" by Petula Clark (#45 to #27), "Up Up And Away" by The Fifth Dimension (#44 to #29), "C'mon Marianne by The Four Seasons (#65 to #30), "Sound Of Love" by The Five Americans (#37 to #31), "Here We Go Again" by Ray Charles (#49 to #33), "Society's Child" by Janis Ian (#56 to #36), "Mary In The Morning" by Al Martino (#53 to #38) and "For Your Precious Love" by Oscar Toney, Jr. (#60 to #40) all continue to make their climb up the chart. 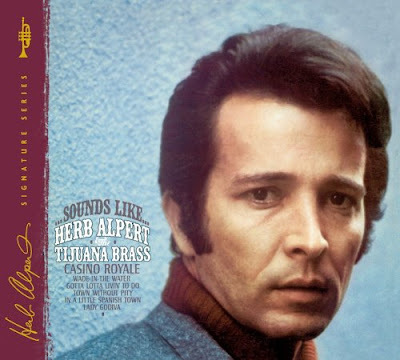 We've got a brand new album on top of the charts this week as "Sounds Like" by Herb Alpert and the Tijuana Brass FINALLY displaces The Monkees' second album, "More Of The Monkees", after eighteen straight weeks on top. It is the first non-Monkees LP to top the chart this year ... and it's already June! Meanwhile, The Monkees' brand new album, "Headquarters", leaps from #197 to #6!!! And a week later it, too, will top the chart … but this time it'll only be a one week run. A little album called "Sgt. Pepper's Lonely Hearts Club Band" will debut next week … and it's about to revolutionize the way albums are made forevermore. Billy Joe Royal records "Hush", with Joe South producing. In the case of Loving vs. Virginia, The United States Supreme Court declares all US State Laws prohibiting interracial marriages to be unconstitutional.